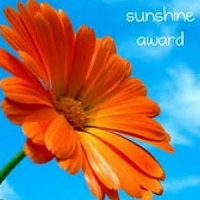 The weather around here has been pretty gloomy lately so it was nice to find out that Sage of The (mis)Adventures of Sage gave us the Sunshine Award. We are new followers of Sage and think she is a super fun dog. Every time she goes for a hike her goal is to find a puddle to splash in. 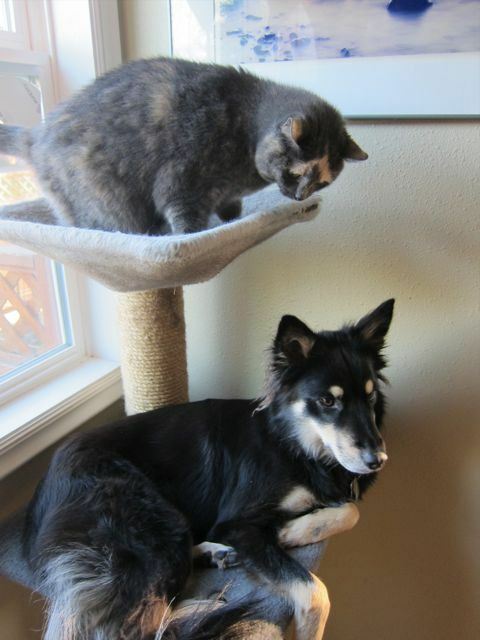 She also enjoys the view from her kitty siblings cat tree, but the kitties aren’t so sure they like having her there. If you don’t already know Sage you should visit her blog and say “Hi”! Favorite Number? I have always been partial to “3”. Other than it being the day of my birth I don’t know why. Millie doesn’t have a favorite number as far as I know. Favorite non-alcoholic beverage? I love a tall cool glass of milk. Millie has only ever had water so I guess that would have to be her favorite. Facebook or Twitter? I’m on Facebook and have a Twitter account that I don’t use. Millie has no idea what any of that is. Your Passion? I guess my passion would be anything to do with sewing and generally being crafty. I just learned how to crochet so I’m enjoying that too. Millie’s passion is definitely to dig her way to China. We don’t mind when she does it in a snow pile, but digging in her daddy’s garden is not appreciated. Favorite Pattern? As someone who sews I’m not sure if you mean a graphic pattern or one that I use for sewing. LOL! My favorite sewing pattern right now is for my drawstring project bags that I can now make in my sleep. My favorite graphic pattern is paisley. Millie likes that pattern her paws make in the snow. Favorite Day of the Week? Every day! I’m retired so sometimes I don’t even know what day it is! Millie feels the same way since she doesn’t have any concept of a work week. What a lucky dog! Favorite Flower? I love roses, especially the Ragusa roses we have in our yard. The smell is just divine. Millie is too young to know what a flower is, but we will see what she thinks come spring. Now we are supposed to pass this award on to some of our fellow bloggers. The rules say we are supposed to pass it on to 10 other bloggers, but we know many of you have already received this award. We will try to name a few that are special to us or we think haven’t received this award yet. First up is The Quilting Doberman! Nim and his mom live in the Pacific Northwest and go on lots of hiking adventures. He also is working his way toward a Rally Obedience title. 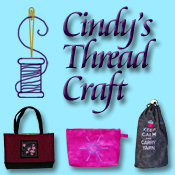 Oh yeah Nim’s mom is also a quilter and shares her other crafts too. I found this blog from a quilting blog hop, but have it among my list of pet blogs. Our next awardee is Rottrover. Bart and Ruby are a couple of fun-loving Rottweilers that do a lot of hiking and swimming. If you don’t know them you should visit them and say hello. Third on our list is Spotty, Spotty, Polkadotty. Blueberry is a blue heeler (Australian Cattle Dog) mix that lives in Arizona. Who doesn’t just love the name of her blog? I love the way it rolls off your tongue. Last on our list is Sagira’s Agility Adventures. Sagira is a very talented husky/sheltie mix who has already earned a bunch of titles. The name of her blog is a bit misleading since her blog is about her and all her siblings. She has a younger brother Bokeh, an Australian shepherd who is working toward becoming a world-class frisbee dog, an older sister Starr who is a Weimaraner and just recently they added a border collie puppy to their family. Her mom is very active in Weimaraner rescue too. Well there you have it. Thanks again Sage for giving us this award.